Figure 4.16 Schematic of the NOv family. Arrows indicate conversion pathways between species. These two processes make comparable contributions to HNO, loss in the lower stratosphere. As the altitude increases, photolysis becomes progressively more important, until, in the upper stratosphere, it dominates. Interconversion among NOy reservoirs An important feature of the NOv family is the existence of reaction pathways that directly convert the reservoir species N,Os, Br0N02, and CIONO; into HNO,. These reactions all take place on sulfate aerosol surfaces. 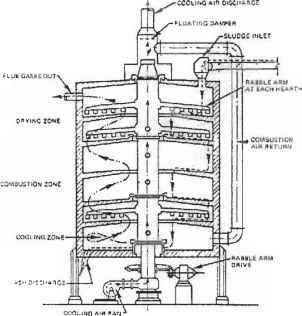 As a result, these reactions will be most important in the lower stratosphere, with diminishing importance in the mid-stratosphere and essentially no importance in the upper stratosphere, and the efficacy of these reactions will depend on the sulfate aerosol SAD available for reaction. The SAD is highly variable in both time and space, and thus the effect of these reactions will also be variable. The sticking coefficient /for this reaction is -0.1, with a very small dependence on temperature (see DeMore et al. , note 17 of Table 64). The hydrolysis of CI0N02 and Br0N02 are generally less important. The sticking coefficient of the hydrolysis of C10N02 is a strong function of temperature, and in general these reactions are important only for enhanced SAD, such as that found immediately after a volcanic eruption, or at temperatures below -200 K. These conditions are rarely found in the stratosphere, and therefore these heterogeneous reactions can be generally ignored. There are, however, certain circumstances where these reactions can have an impact . The sticking coefficient for the hydrolysis of Br0N02 is quite large (-0.8, independent of temperature ), but due to the small abundance of Br in stratosphere this reaction has little impact on NOv partitioning. Again, the exception is during times of high SAD, such as that found after a volcanic eruption (this will be discussed further in Chapter 6). 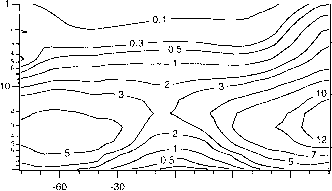 Figure 4.17 shows vertical profiles of total NO . and its major stratospheric components. 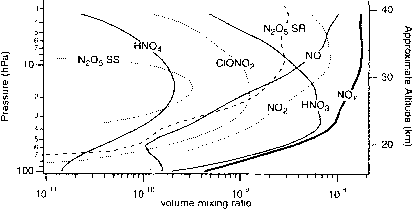 In the lower and mid-stratosphere, HNO, makes up most of NO,. In the upper stratosphere, NO, is the dominant component. The plot also shows that the N;iO, abundance is higher al sunrise than at sunset. This is consistent with N2Os being formed at night and destroyed during the day. 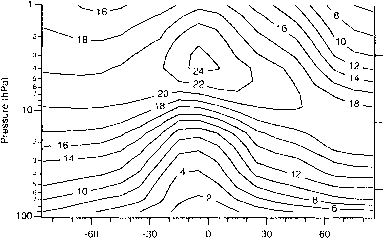 Figure 4.19 Contours of NO, abundance (ppbv) for December. 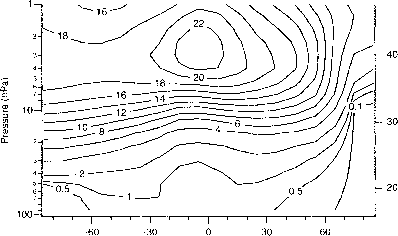 Values are from the Goddard two-dimensional climatological circulation model [731. Based on a model run to steady state using N,() emission levels for 1990.